Energy Savings Two-stage cooling design operates on low most of the time, providing comfortable temperatures while reducing energy use. The system only operates on high when necessary during peak, warm weather conditions. Your energy savings are further increased by a cooling efficiency rating of up to 17 SEER. 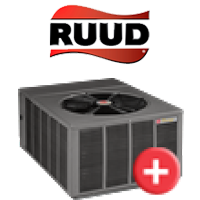 Greater Comfort When matched with a Rheem variable speed furnace or air handler, the system adjusts airflow to help control humidity 102% more effectively than standard efficiency units, for unsurpassed comfort in the cooling mode.